As you might suspect, Major League trades — especially when there’s a deadline — don’t come in a neat and tidy process. It’s sloppy and time-consuming and anything but linear. 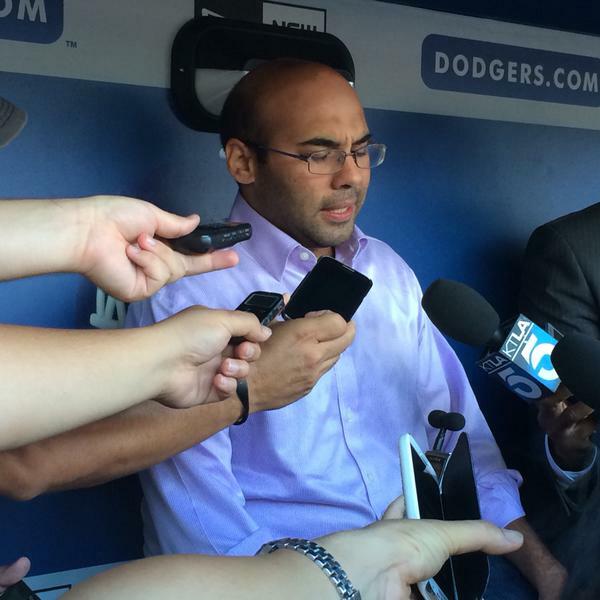 Tonight, Dodger general manager Farhan Zaidi spoke tonight the Dodgers’ deadline deals, and offered some interesting perspective about how they actually get approached and executed. 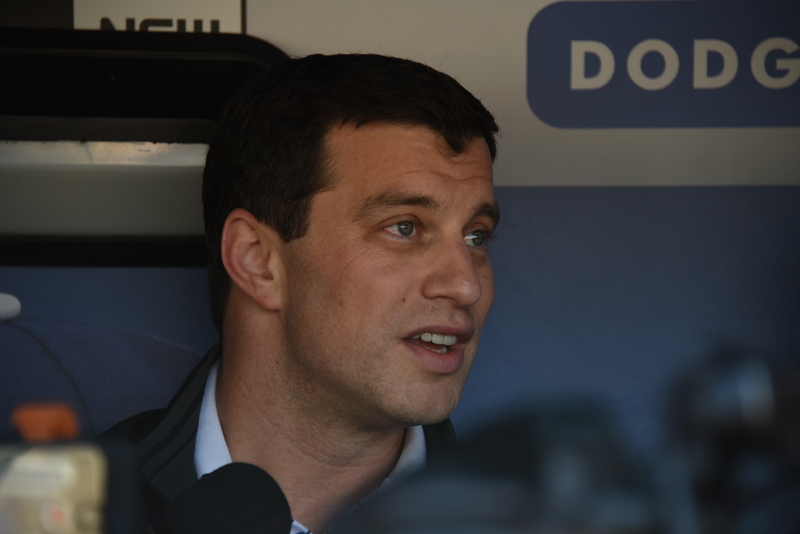 New Dodger pitchers Jim Johnson, Luis Avilan and Alex Wood spoke to reporters this afternoon about their trade from Atlanta to Los Angeles. (Mat Latos has not landed in Los Angeles yet) Watch the video above. After delaying his scheduled Wednesday start because of a sore hip, Clayton Kershaw threw a bullpen session Thursday and was pronounced fit. But with the luxury of having Zack Greinke available on four days’ rest tonight, the Dodgers are giving Kershaw one more day of rest before bringing him back the mound Saturday. Greinke will be starting for the first time since Sunday, when his 45 2/3-inning scoreless streak ended. The third batter he faces will be Angels star Mike Trout, who himself missed time this week with a sore wrist. The two faced each other July 14 in the first inning of the All-Star Game, when Trout hit a leadoff home run. Kershaw and Greinke have a chance, according to the Elias Sports Bureau, to become the teammates with the lowest ERA in a calendar month ever. The record is 0.49 by Orel Hershiser and Tim Belcher in (surprise) September 1988. Greinke basically needs to pitch shutout ball, because even if he allows only one run in a complete game, the duo’s ERA would rise to 0.50. Southern California’s other 23-year-old center fielder, Joc Pederson, is resting tonight, and Don Mattingly said that Pederson might sit out one or two more games this weekend to get him some rest and allow him to regroup mentally from a July in which he has had a .488 OPS. Mattingly made clear that it was not a punitive benching. To make room on the 25-man roster for newly acquired pitchers Luis Avilan, Jim Johnson and Alex Wood, the Dodgers have optioned Mike Bolsinger and Zach Lee to Triple-A Oklahoma City and placed Justin Turner on the 15-day disabled list. Michael Morse, who was designated for assignment Thursday by the Dodgers after coming to the organization in the Mat Latos deal, has been traded to the Pirates (with cash considerations) for outfielder Jose Tabata. Tabata, 26, was designated for assignment by Pittsburgh with a .341 on-base percentage and .289 slugging percentage in 41 plate appearances (including one certain hit-by-pitch with two out in the ninth inning against no-hit throwing Max Scherzer of Washington). He is not on the Dodgers’ 40-man roster and will be assigned Triple-A Oklahoma City. There was no Dodger game Thursday, but it wasn’t exactly a day for lounging on the couch at home. In addition to all the player trades — which Don Mattingly, Orel Hershiser, Charley Steiner and A.J. Ellis react to above — Adrian Gonzalez hosted his Adrian Gonzalez Baseball ProCamp at Granada Hills Charter High School, as David Adler writes at MLB.com. And of course, Clayton and Ellen Kershaw hosted their annual Kershaw’s Challenge PingPong4Purpose event, which was well attended by celebrities and ballplayers alike. Steve Bourbon of MLB.com has a report from the event. Some video and photos follow. With today’s big transactions, the Dodgers had to reconfigure space on the 40-man roster to make all the pieces fit. Three players who have suited up for the Dodgers this year — Brandon Beachy, Chris Heisey and Chin-hui Tsao — were designated for assignment. A fourth, Chris Hatcher, was moved to the 60-day disabled list, meaning that he can’t be activated until mid-August. Michael Morse, who came from Miami today, was also designated for assignment. Taking on Morse’s contract helped the Dodgers acquire Mat Latos without sacrificing more in prospects than Jeff Brigham, Victor Araujo and Kevin Guzman. Bronson Arroyo, who is recovering from Tommy John surgery, was placed on the 60-day disabled list, while infield prospect Jose Peraza was optioned to Triple-A Oklahoma City. 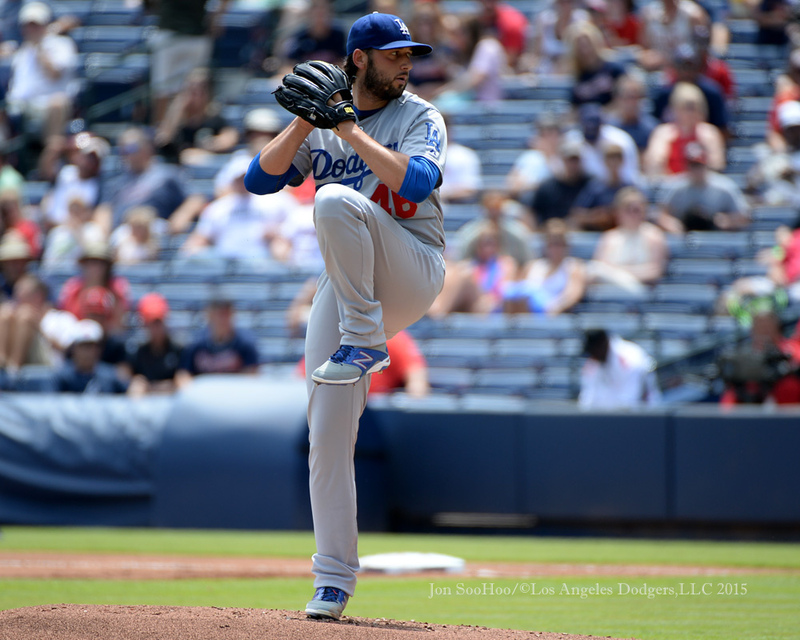 It’s a massive move that puts five established pitchers in the Dodger starting rotation from now through October. It’s a win-now, win-later maneuver that deepens the franchise for years to come. In a three-team deal with Atlanta and Miami, the Dodgers have acquired left-handed pitchers Alex Wood and Luis Avilan, right-handers Mat Latos, Jim Johnson and Bronson Arroyo, second baseman-shortstop Jose Peraza and outfielder-first baseman Michael Morse. A’s at Dodgers, 7:10 p.m.
Clayton Kershaw’s scheduled start tonight has been moved to Friday by the Dodgers, amid reports of a sore left hip or glute muscle. Mike Bolsinger, who threw seven innings and allowed no earned runs seven days ago in Atlanta, will start in Kershaw’s place. 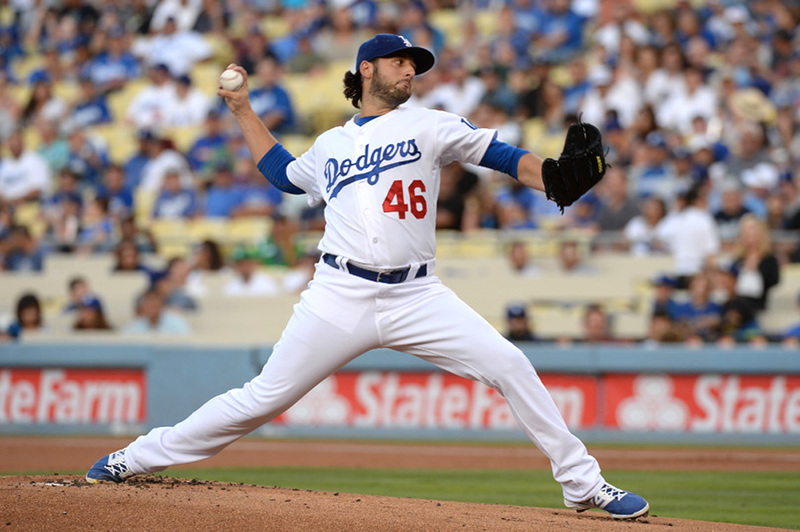 Bolsinger has a 2.79 ERA this season — 1.59 in his past three starts. 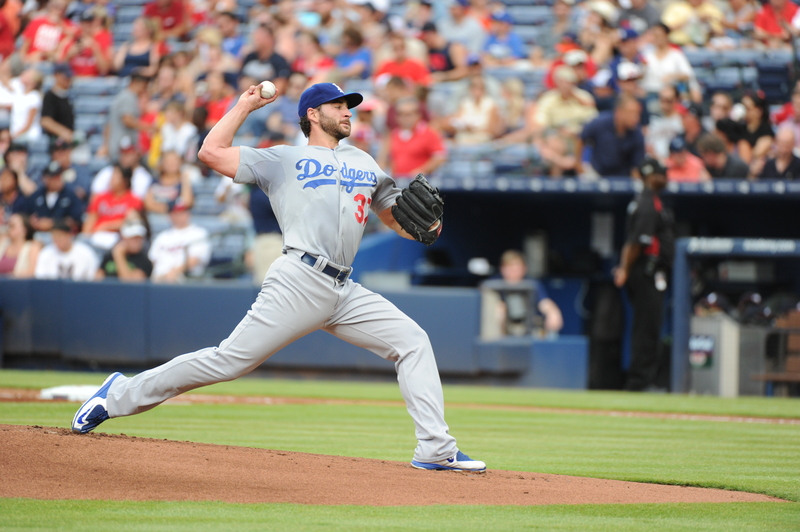 Kershaw will bring his 29-inning scoreless inning streak up against the Angels on Friday. 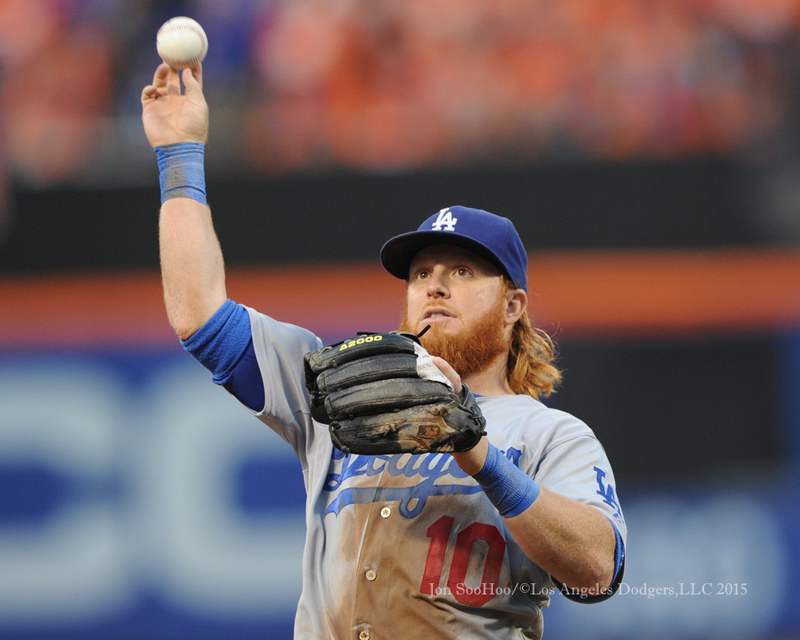 Justin Turner, who is suffering from a leg infection, remains sidelined. Alex Guerrero is scheduled to make his first start at third base since May 19. Joc Pederson is batting seventh, his lowest spot in the order since July 5. Pederson has a .239 on-base percentage and .271 slugging percentage in July, with one homer and four walks against 28 strikeouts. “He’s working on different things,” Don Mattingly said after Tuesday’s 2-0 loss to Oakland, according to Eric Stephen of True Blue L.A. “It’s not like he’s just going up there, I know it looks like he’s swinging for the fences all the time. That’s not what he’s trying to do. … He’s trying to get inside the ball a little bit using his bottom hand. He’s frustrated. Two years to the day after 22-year-old Yasiel Puig’s thrilling, extra-inning walkoff homer to beat the Reds, it’s fascinating to see how many people are ready to shut the door on 24-year-old Yasiel Puig’s future as a baseball player. Puig’s in a slump, it’s fair to say. He’s coming off a mixed bag of a week in which his only two hits were home runs, and his OPS has dropped from 1.047 on June 12 to .750 today. 1) His OPS was 1.047 on June 12. That’s very good. 2) One good week would halt the complaining, and one good month would render it laughable. It would take a deep level of cynicism to assume Puig wasn’t capable of such a turnaround. Though they are not the same player, I continue finding it hard to resist comparing Puig with the four other hitters in Los Angeles Dodger history that have made the greatest impact by age 22: Tommy Davis, Willie Davis, Steve Sax and Adrian Beltre. The impatience with Beltre, one of the greatest all-around third basemen baseball has seen, is still a viscerally unpleasant memory for me. It’s so convenient, even comforting, to think that young players develop in a solidly upward trajectory, but it’s just a fantasy. Kids have growing pains — mental and physical — and adjustments can take weeks, months or even years. Or haven’t you noticed? What kind of player will Puig ultimately be? I have no idea. But this idea that the clock has run out on him, that if he hasn’t fixed what’s bothering him yet, he won’t fix it at all, is far too reactionary for my tastes. And not for nothing: Puig at his worst is still a player with value. 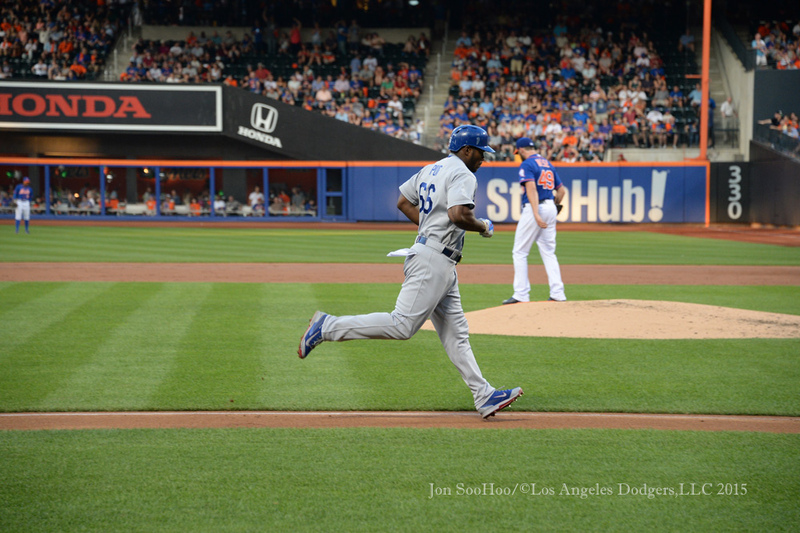 Dodger manager Don Mattingly said that Puig has shown signs of improvement since the All-Star Break. “I think he’s been better lately,” Mattingly said. “Before the break, he looked a little rough. … I know he’s been working in the cage, doing certain things, trying to keep his lines a little straighter, a little less turned. I think he understands he’s not swinging as well as he’s capable of. Needless to say, it would be naive to expect a sudden mellowing of opinions on Puig. Justin Turner is out of tonight’s starting lineup after having to go to the emergency room today to address a worsening infection in his leg. The problem began with something “like a pimple” while Turner was in New York, according to Dodger manager Don Mattingly. He was given antibiotics, but the condition continued to worsen over Monday’s off day. Turner hit .424/.457/.727 with four doubles and two homers on the recently completed road trip, capped by his two-base hit in the Dodgers’ ninth-inning rally Sunday in New York. Turner went out for a pinch-runner after that double, but that was not health-related. Among all Major Leaguers with at least 250 plate appearances, Turner is fifth in weighted runs created, behind only Bryce Harper, Mike Trout, Paul Goldschmidt and Miguel Cabrera. He is 16th among big-leaguers in Wins Above Replacement. Beginning tonight, the Dodgers are opening a Kosher stand that will begin service by offering three types of Kosher hot dogs. Located at the grill adjacent to Tommy Lasorda’s Trattoria in the right-field plaza, the stand will offer a Kosher Dog and a Jalapeno Kosher Dog for $9 each and a Kosher Italian Sausage for $10. The stand will be open at Dodger home games except Friday and Saturdays and Jewish holidays. Additional food items will be added in the future. In addition, the Dodgers will celebrate their 16th annual Jewish Community Night on August 30 when they host the Chicago Cubs at 5:08 p.m. 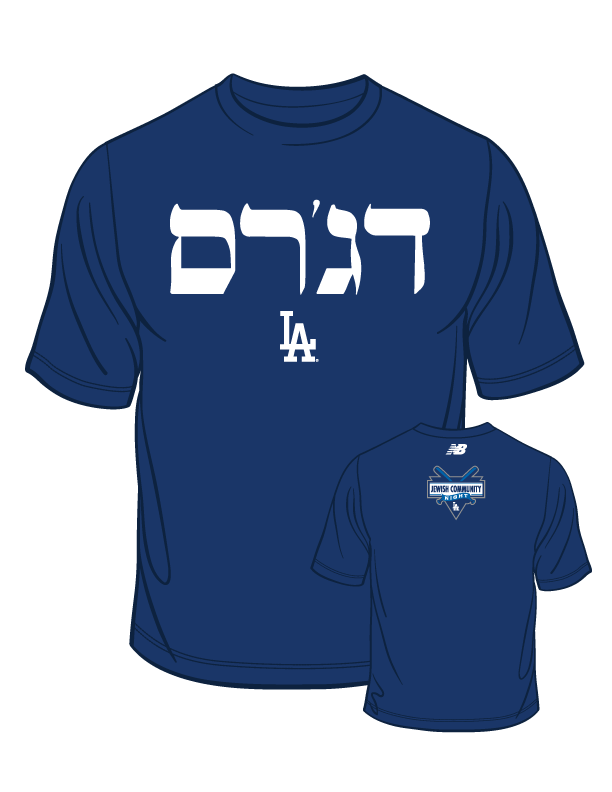 The Dodgers are offering a special ticket package, which includes a voucher for a Dodgers-in-Hebrew T-shirt and a ticket to the game in the Reserve MVP or Preferred Reserve sections. An additional Kosher food stand will be available in the Left Field Reserve section. In addition, the first 40,000 fans in attendance August 30 will also receive Dodger headphones. A limited number of tickets for Jewish Community Day are still available and can be purchased at dodgers.com/jewish. In order to receive the commemorative item, fans must purchase the ticket package through the website. The commemorative item is available while supplies last. Anyone interested in groups of 20 or more should call (323) 224-2642. 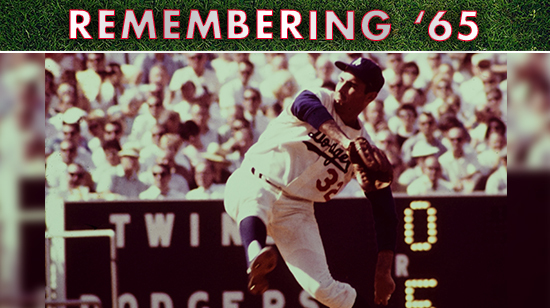 Sandy Koufax wasn’t much of a hitter in his career, but in July 1965, he arguably had the greatest clutch at-bat by a starting pitcher in Los Angeles Dodger history. Good day, everyone. I’ve got a long buildup of links to share, and today’s off day provides the opportunity.